10 Complete Energy Packages in One Book! captivating images to transform your entire life! Enclosed within these pages are the keys to true spiritual magic, which will ignite your multidimensional memory and fire the keys and codes within your original spiritual blueprint. This will in turn allow you to embody the magnificence which you truly are and allow you to understand why you have come to Earth at this time. Masterworks is a definitive compilation of higher dimensional energy transmissions for the “new paradigm” spiritual teacher and student alike. It contains nine newly updated energy packages plus many new features. These include Psychic Storm, The 13 Crystal Skulls from Atlantis, The Holographic Records of Earth, Welcome to Earth, The Golden Age Business Plan, Cellular Regeneration, Manifest Destiny, Essential Programming, Magic House, and much more. This large spiral-bound edition provides easy access to all the energy; whether you are going to or giving a workshop, a conference or just relaxing at home taking it all in. As you read through these pages and browse the images you will begin to remember your galactic heritage and be able to integrate the new 5th dimensional concepts and spiritual laws which await us in the ‘new’ Golden Age. It is also important to know that each of these books has been personally energized and signed by me and blessed by my divine assistance on the etheric levels. 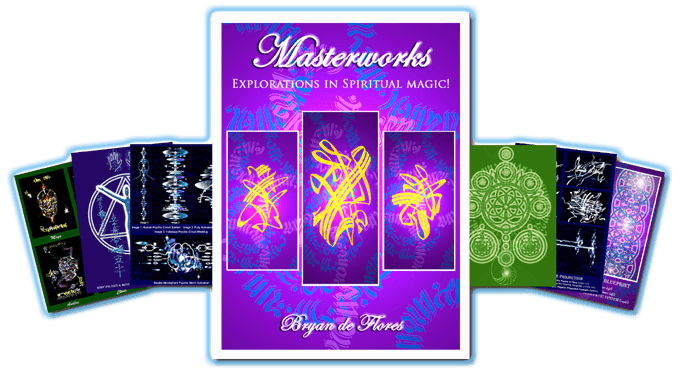 Masterworks contains 39 pages of color accelerators and images, over 31 pages of black and white activators and two instructional mp3 recordings (sent to you via email) for Manifest Destiny and Essential Programming. Absolutely awesome! Masterworks includes the Instant Activation ‘Destiny Fast-Tracking’! and the Manifest Destiny and Essential Programming mp3 recordings. The Hierarchy’s current assessment of the Earth process has created a new opening for a more diverse and effective level of teacher and planetary Ambassador. These new level Ambassadors will take the lead and be fully initiated into all of the magical arts; have full command of the Celestial Forces of Light at will; while bringing forth a stronger, more physical God-presence here on Earth. Although many former programs did serve to create awareness and a sense of responsibility, it is now necessary to implement a more modern and upgraded training structure for all individuals anticipating and awaiting their next assignment. This Ambassador Training Manual will greatly assist others who desire a higher education and wish to step up to fast-track their life and upgrade their spiritual status to an Ambassador level. In this manual a full explanation will be given of what an Ambassador is and what one does to attain such status and receive all the benefits. Have you ever seen faces, pictures or symbols in rocks, clouds, trees or other natural formations? Many of these images are elusive, visible one moment and disappearing the next. The natural elements of Earth are a mirror for all that has been, all that is and all that will be created here on Earth. These images are the ancient & future historic records sent from the core of this planet to awaken the cellular memory of mankind. There are many locations on Earth where the “holographic” projections are seen more easily than others. Nature’s untouched canvas allows for much clearer reception than modern man’s fabricated perception of reality. The images in the Holographic Records package are exact duplications of formations I viewed when I was vacationing in Colorado. They will assist you in thinking and living ‘outside’ the limited 3D box. Each picture will shift and change according to the consciousness of the viewer. Awesome! Achieving Success in a Spiritually Based Workplace! This new ‘third edition’ package of information will assist you in understanding and integrating the new paradigm groundbreaking concepts for planning a new business or transforming an existing business into a successful enterprise. It is a large 8.5″ x 11″ 20-page booklet which contains 14 powerful manifestation affirmations and 2 color images; The New Paradigm Business Accelerator and The Goal Achievement/Financial Prosperity Template. The ‘Business Plan’ also includes seven black and white energy templates and business affirmations for concept integration. The images and affirmations will assist in aligning all thoughts, words and actions with the higher dimensional ‘perfected’ Golden Age frequencies of integrity, creativity, unity and financial abundance. Topics include: The Mission Statement, Determining Your Course of Action, Manifesting the New Paradigm in Business, Developing a Product, New Paradigm Advertising, Original matrix Franchising, Investors, Partners and Contracts, Website Design and much more! In the near future, business practices will change because the reasons we do things will change. We are creating a world where everyone will live in abundance and every business will serve the highest good for all. Hold these concepts in your mind and heart each and every day, knowing this philosophy will lead you into higher levels of consciousness and the new ‘Golden Age’. Review these ideas often to keep you inspired and passionate. Rise above the greed and poverty and remember who you are and what the greater picture involves. Take your place upon the throne of prosperity and abundance, for it is your birthright to have everything you desire and to manifest your wildest dreams here on Earth. This is the truth of who you are! Live, Love and Prosper! Enhancing Intuitive Insight and Brain Capacity for the New Millennium! Since the advent of modern technology our intuitive senses are often diminished or completely shut down due to our over-dependence upon these ‘external’ creations. Technologies such as computers, telephones, television etc. have their value, however when compared to our ‘internal’ psychic technologies these man-made creations pale in efficiency and potential. When these ‘higher psychic senses’ are properly activated and worked with on a daily basis they allow us to interface with the world and other technologies more seamlessly, with less friction and enhanced capability. Psychic Storm will assist in activating all psychic circuits within you and take you on a fascinating journey into the inner workings and progression of psychic energy. The package includes new acceleration templates, along with multimedia recommendations for enhancing psychic perception. The first section begins with a detailed analysis of modern-day psychic energy and its uses. As you begin reading the transmission, a subtle ignition and activation will begin within the dual hemispheres of your brain, sparking all the psychic circuits within your body. Accompanying this section are three ‘electrical storm’ templates which will send a series of 5D stabilized pulse waves into the brain for stabilizing and regulating the storm once it is engaged. This section focuses on the ‘how to’ of using individual and group psychic energy to dramatically accelerate the healing and ascension process. Accompanying this information is a simple step by step process to accelerate the auric particle spin, regress any current health issues and maintain an optimum healthy state within the body. As you read this section, the ‘psychic storm’ within your body will be further expanded and sparked by 3 higher chakra ignition plates. It will greatly enhance your five physical senses as well as expand the psychic senses beyond the Earth plane into the unlimited universal creation. This section also includes information regarding Natural Kingdom and Celebrity Assistance Programs, etheric template creation and the ability to alter outcomes and balance external technologies. A Complete Foundational Energy Reference Guide for Spiritual Seekers! This new package will provide lots of information and inspiration for all spiritual aspirants who are developing their spiritual abilities and seeking higher consciousness. The Welcome to Earth package includes all the basic spiritual/metaphysical understandings, including many simple transformation techniques to assist you in becoming a more perfected you. Welcome to Earth will fill in many gaps in your comprehension of all aspects of the non-physical realities, including why you are here and who you are becoming. This package is a pivotal addition to your studies in that it will allow you to complete your initiations and excel into mastery with more understanding of why things are happening. It will also help you to integrate and decode the information and spiritual energy packages you are receiving on a daily basis. The Matrix: Illusion vs. Reality; The Polarity Integration Game; The Nature of Energy; The Origins of the Soul; Reincarnation and Karma; The Dimensional Structure of Earth; God, the Celestial Hierarchy and the Multidimensional Self; Ascension and the 7th Golden Age; The Christ Experience; Linear and Spherical Time Structure; Corrective Meditation and Visualization Techniques; Connecting with Physical and Non-Physical Guidance; Soul Contract and Spiritual Destiny; The Five Elements and the Devic Kingdom; Physical and Non-Physical Spiritual Tools; Spiritual Laws; Walk-ins and the Indigo Children; Earth’s Energy Vortexes and Gridlines; the Galactic Family; The Seven Point Chakratic System; DNA Structure and Upgrading Process; the Influence of Negative and Limiting Thoughts and Emotions on Physical Health; 5D Lightbody Manifestation; Intuition and the Psychic Senses. all of Your Dreams a Reality! Everyone currently living on planet Earth is here to experience and contribute their energy and skills to the mass awakening in consciousness which is occurring at this time. In order to fulfill our individual parts in this amazing transformation, we must make the conscious choice to align ourselves with the true destiny path we have come to walk. However, it is not always an easy task to find the daily inspiration and determination needed to manifest our individual spiritual missions and fulfill our part in the planetary destiny. Furthermore, this ‘destiny quest’ requires nothing less than our complete focus and a profound sense of inner connection and determination. It also requires us to take risks, to make the appropriate choices and to trust in the power and magic of Spirit; the unseen guardians guiding humanity into the new ‘Golden Age’. The ‘destiny quest’ is a monumental journey that each of us chose to embark upon before incarnating here on Earth eons ago. It is the process of retraining our minds and bodies; returning to the original perfection and connection our souls experienced at the beginning of creation. Each lifetime has been a giant step in the process of remembering who we are and what we are capable of. However, for many individuals now living on Earth, it is in fact the final incarnation. This means, that a ‘consciousness graduation’ is occurring and that all individuals who are ready and choosing to transcend this often traumatic, intense, physical experience are now moving into a new, more perfected frequency and physical life. This new frequency is multidimensional in nature and is currently manifesting before us. However, only those who are fulfilling their spiritual contracts and manifesting their mission will be able to perceive and live in this new frequency. At this extremely important point in time in history, I would like to announce the arrival of my new groundbreaking, intricately detailed energy package entitled ‘Manifest Destiny’. This large 8.5″ x 11″ booklet was meticulously designed to assist all individuals living on Earth in aligning with their soul’s purpose, mission and destiny path. It contains all the details on how you can manifest your mission in a very magical and practical way, within a very short period of time. In addition, it will assist you in transcending all of your fears and concerns regarding your mission and destiny, and help you to receive the etheric financial and assistance dispensations you need to move forward. Furthermore, “Manifest Destiny” contains some of the most beautiful artwork I have done to date, including a set of ‘new paradigm’ sacred geometry accelerators and a colorful detailed representation of the ‘Destiny Path’. Additionally, I have added a special ‘mission and destiny’ activation mp3 recording, which will accelerate conscious access to your unfolding mission details and connect you with your primary guardian angel and assisting spiritual guides. In short, the “Manifest Destiny” package will propel and provide you with the necessary information you need to move forward and attain the ultimate goal! Building the Perfect Body of Light! As you believe so shall it be! Do you believe you can inhabit a perfect body, one that is self-regenerating, disease free and ageless? The fact is that our human bodies were designed to last much longer than the current projected life-spans suggest. In truth, if an individual takes great care of his or her body and continues to progress in consciousness, the ‘perfected’ physical body can last between 250 and 1000 years. However, modern man has declined in consciousness to such an extent that there are many thought-forms and beliefs (including the ones that promote aging, illness and death) that prohibit long life and eternal youth. Question: Would you like to live in a state of physical, mental and emotional perfection, free of all illness and limitations? Realizing that most illnesses and diseases are caused by mental and emotional stress. This stress is caused by many imbalanced and fear-based attitudes, beliefs and thoughts. The understanding that vibrational healing and many other spiritual technologies can remove genetic disease patterns and clear negative cellular memory. Trusting in the innate wisdom of the body and its ability to guide you through the healing and acceleration process. Activation of the perfected “Master Cell” existing within each physical body. Contained within these pages are many new concepts and techniques, which when assimilated and applied, will allow you to easily flow with the energy shifts and be able to maintain a healthy and balanced state of being. and etheric organ and system replacement. – The “Cellular Activation” color accelerator! – Six black and white healing and activation templates. – Language of Light regeneration codes. “These 12 living depositories of knowledge were forged through the wills and hearts of those souls who transcended the 3rd dimensional human experience”. Modern science considers the skull to be the seat of logic and intelligence. Within the skull lies an organic living computer which creates our multidimensional reailty.This is the human brain. It houses the memory, experience and the consciousness of a species. Science also tells us that most of humanity uses only 10% of it’s brain capacity. The other 90% is currently untapped potential. However, there have been periods in Earth’s history where ancient civilizations have possesed full universal awareness. Long ago, ancient Atlantis was visited by extraterrestrial races that shared spiritual knowledge and technology with the Atlantean people. The exchanges included 12 crystal skulls that provided access to off-planet reservoirs of knowledge. An astrological altar was constructed of four base metals (copper, bronze, gold and silver), creating the most magnificent setting for the skulls. This circular altar was divided into four quadrants and aligned to the four directions. The skulls were placed in threes, according to the astronomical location of the star or planet holding the information.When all 12 skulls were placed in the circle, an etheric 13th skull would manifest in the center of the ring, completing the circuit. This invisible component caused the ring of skulls to interface with the off-planet data banks allowing them to receive and transmit vast amounts of universal data.The skulls were utilized for thousands of years, assisting humans in communicating with other races and drawing divine knowledge from the universal akashic record.As the Atlantean epoch came to a close, some of the skulls were redistributed within Earthï¿½s field and the others were removed due to the coming dark age and the descent of human consciousness. Many crystal skulls have been discovered since the beginning of the 20th century.They continue to fascinate and mystify those who come into contact with them. Science can offer no explanation for their creation.These solid crystal receptacles seem to interface with each living human brain they come into contact with. Each skull is linked to one of the 12 planetary libraries holding the complete akashic record and evolutionary keys for this universe and beyond. Earth is one of the 12 libraries composing this Great Ring of Knowledge. The names and locations of the other 11 have remained sealed.As these libraries are activated once again, new possibilities and avenues of expression become available for humanity. This is the first manifestation of the complete collection since Atlantis. The crystal skull accelerators contained in this package are direct energetic links to the original skulls from Atlantis. These images create a powerful portal of energy when they are placed in the original altar formation. Each has it’s own distinct personality and will transmit and receive energy in it’s own unique way. Each of them has influenced the art and culture of the ancient golden age civilizations listed. By tapping into the energy of these skull accelerators we can begin to open the vast realms of our own minds. The skulls remind us of our unlimited potential and the reality of physical immortality. Interacting with the skulls allows us to tap the wisdom of the ages and beyond. for Realizing Full Human Potential! Have you ever dreamed of having direct access into your own soul blueprint? Have you ever thought of how easy it would be to just flip a switch and instantly turn on your intuition, time-travel abilities and telepathic communication centers? Have you been waiting for a ‘next step’ in your spiritual training and evolution? If you answered yes to one or more of the questions above, you have arrived at the perfect place. You have been guided here, to this page, to a new possibility. It is a new energetic human navigation system called Essential Programming. For the average price of a private session you can purchase the Essential Programs package, which will allow you to have direct access to your own and others blueprints. You will be able to transform, change and modify the internal energetic programs pivotal to the operation of the human system. This Essential Programs package will serve as a guide for the many souls who are choosing to move into higher states of consciousness. The procedure is simple, easy to learn and very effective for both the beginner and those individuals who are in the advanced stages of fine-tuning and manifesting their Lightbodies. This process is the perfect addition to any transformational modality and will fit in with anything you are currently doing. This method is energetic in nature, meaning it is performed by the individual using an energy transmission of their choice. This technology is very practical as it utilizes simple terminology and can be performed in any location and in any situation. The Essential Programs process was developed in collaboration with the higher spiritual collectives/God Guardians and targets these twelve major programs. This technology will quickly and easily upgrade the transforming human systems in this time of accelerated growth and Ascension. It has been used in the Orion, Sirian, Arcturian and Centuarian systems during their former transitions into higher dimensional states of consciousness. This technique has been slightly modified to accommodate the current state of our planetary, mental, emotional, physical and spiritual bodies. Essential Programming works on the deepest core soul levels. It clears negative cellular memory and begins to fire each of the genetic light codes sequentially, allowing a smoother and more graceful transition process. The Christ-field alignments are ‘Language of Light’ mathematical encodements, which reset the original blueprint and align one with their true purpose and destiny pattern. The alignments will also maximize the clarity and radiance of the Christ Consciousness in the Mental, Emotional, Physical and Etheric bodies. This purification will allow the Electron Bodies and Higher Self to project the soul’s original power into the physical world. 1) 27 pages of information detailing the 12 Essential Programs and the procedure for upgrading and when necessary, replacing the programs. Some of the programs include Body Maintenance and Orientation, Dream Recall, Communications, Manifestation and Soul Contract. 2) Four incredible new color accelerators, which provide half of the energy for the upgrades and help to keep the integrity and original clarity of the process. It is time to truly turn your home into a castle! The new multidimensional environmental blueprinting system is the latest spiritual technology, used for enhancing and anchoring the magic, purity and clarity of Spirit into your home. The new blueprint connects directly with your mission and destiny pattern, allowing you a stronger and clearer sense of direction and timing. This blueprint will also allow your spiritual guides to more tangibly manifest in the home, due to its purity and clarity. Anchoring the new environmental blueprint into your home will dramatically enhance your physical health and prepare the environment for the manifestation of the Lightbody. It will greatly accelerate your ascension process by enhancing dreams and bringing a profound clarity and balance to your mental and emotional bodies. The new blueprint has many other aspects to it that will anchor in as your consciousness upgrades. There is a self-cleaning mechanism, which transmutes all dust, dirt and pollution while also preventing insects and other unwanted nuisances from entering the home. There is also a climate/temperature control feature that stabilizes the temperature of the home, despite outside weather patterns. The new blueprint also makes time-travel possible and enhances both meditation and astral projection experiences. The “Magic House” Package includes eight pages of information including the easy to follow step-by-step blueprinting process. This package also includes an electronic purification image and a blueprint trigger accelerator.